NAB has taken the wrappers off an all-encompassing rebrand aimed at reinforcing its customer-first message to the market. The initiative is the first holistic brand overhaul for NAB in more than six years and is based around its new moniker: ‘More than money’. The tagline replaces the successful ‘more give less take’ positioning, which launched in 2010 and was backed up by the ‘break up’ campaign. The first phase of activity kicked off on 10 July with two TV commercials and stretches from traditional media and out-of-home through to digital, social and in-branch content and advertising. The brand program was developed in partnership with NAB’s creative agency, Clemenger BBDO, and media agency, Mindshare, and revolves around 182 piece of creative execution, from banners and billboards to multimedia content. NAB CMO, Andrew Knott, told CMO ‘more than money’ was an immediate hit with the executive team and board and is reflective of the bank’s ‘one NAB plan’, which is focused around customer centricity. Knott said NAB’s new creative centres on key customer moments and emotional drivers supported by financial decision making, and the majority of the content features real-life customers. The first TVC, for example, uses home movie footage to track the life of one female from birth to adulthood, while the second follows a NAB business customer from startup to international launch. 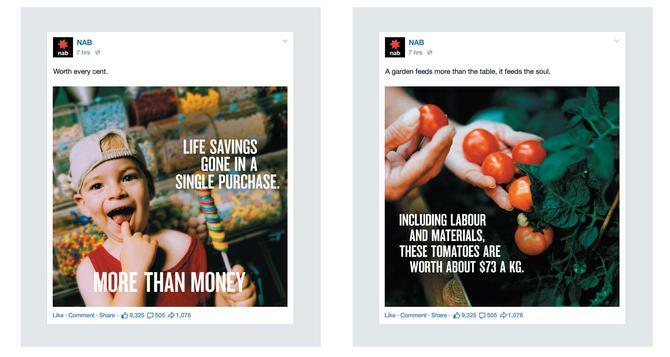 A social advertisement, which will appear in Facebook social feeds, shows a kid in a lolly shop with the tagline ‘life savings gone in a single purchase’. Online video content then goes into more depth around individual stories. “I’m a customer-focused marketer; I believe everything starts and finishes with our customers,” Knott said. “Our success is defined by what they think and ultimately what they do with us. And they own the brand. Knott was just three months into his role as CMO of NAB when he decided it was time to embark on a broad rebranding initiative, which he claimed was “more comprehensive than anything we have done in the past”. The other component to the rebrand is the hope of prompting discussion, he said. “The temptation for a new CMO is to change everything, so I was resistant to doing just that. But the more I spoke to people internally, and to frontline teams and customers, the more the general sense was that NAB isn’t just about giving things away,” he said. “In many instances, we’re people’s lifelong financial partner. People feel very positive about that because of the way in which we do that. It felt our previous brand expression had lived its course. Knott also suggested that in a challenging economic environment where consumer outlook is not as positive as it has been, having a degree of empathy is something customers are looking for from their bank. NAB’s objective is to be most respected bank in A/NZ and that comes back to customer service, Knott continued. Longer term, NAB will look to tailor the brand promise to more specific messaging and customer segments, such as those focusing on their next home or retirement, Knott added.